I joined this forum via The Forum Wheel, and it has just recently became a paid to post forum. Earn 0.02 BMF Coins per new thread. 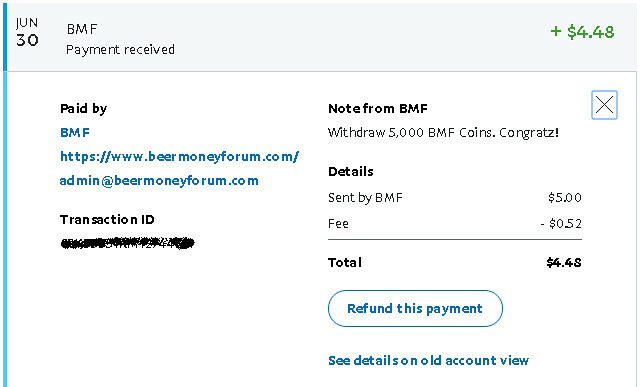 Earn 0.01 BMF Coins per new reply. I am not sure if this is a good place to hang out as it's still very new. I just noticed the information above is not updated, so I think it's good to update the pay rate. Check out the pay rate for how much you can earn on BMF: How much do I earn? There are bonus points for daily login and when your posts are being liked by others too. I think it'd be nice to update the first post, so everyone can see this. So far, I enjoy spending time there. Last edited by kaka135 on 13 Jul 2017, 23:15, edited 2 times in total. Beer Money Forum is an old site and since it is via Forum Wheel then you earn Forum Wheel credits when you post in Beer Money Forum. With the BMF coins, I'm not sure about it although I noticed that I already have $0.90 in my bank. Yes it is an old site. Yes, I remember to be on that site last year. I earned good there but it only stays for a month or more than a month, or maybe lesser. That site did not pay some of my referrals. I did not consider cashing out my balance there because the owner is a young student trying to have a forum site. I would rather not join this site as the site doesn't sound stable to me. I always stay clear from sites which change their rules frequently. I think I have read Beer Money Forum as an old site though I didn't join, but this site seems to be a new one, as there are not many topics around. Or did they just revamp the whole site? Since I have joined via TFW, I'll just see how it goes as the minimum payout is not too high. kaka135 wrote: I think I have read Beer Money Forum as an old site though I didn't join, but this site seems to be a new one, as there are not many topics around. Or did they just revamp the whole site? There is no need of any minimum payout threshold if you have joined it through TFW since you get paid through CPP. [quote="kaka135"]I think I have read Beer Money Forum as an old site though I didn't join, but this site seems to be a new one, as there are not many topics around. Or did they just revamp the whole site? Sounds like the reviews aren't took good for this website...I'll wait for some payment proofs before I look into it. I don't want to add another site to my routine if it's not going to pay. suny wrote: There is no need of any minimum payout threshold if you have joined it through TFW since you get paid through CPP. 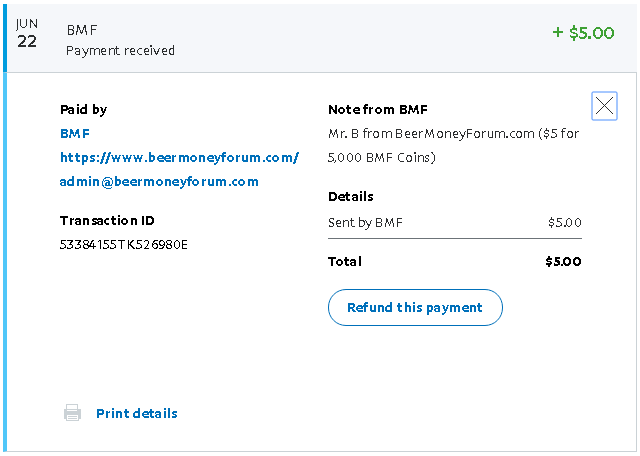 I still earn the coins at Beer Money Forum, so I am not sure if I will be paid by the forum (not TFW) after I have reached $3 there. I have around $0.80 there now, so let's see how it is. I have heard this from other PTP forums but wasn't able to check the forum. Based on the comments above, seems that the forum has some funding problems? Maybe they revamp it because if not, you will see me and @Peachpurple on the site because we were active on that last year sis. From what I remember, it is a blogging site for me with minimum of 200 words. when it is a forum now then it is revamp already. But as we have joined through TFW ... We have to follow the rules. Means for right now we can only create threads. I have been meaning to ask you guys, has the new rule of "post only threads" been lift off? I rather stick with the site through TFW only. Too many scam sites nowadays online. Does any other forum exists in life that treated users the same? Decentlady wrote: I have been meaning to ask you guys, has the new rule of "post only threads" been lift off? I just checked out in the morning. That rule is still there. So TFW users can't take part in comments and all that till the rule is there. Just need to post new threads. [quote="Decentlady"]I have been meaning to ask you guys, has the new rule of "post only threads" been lift off?